When Calls the Heart doesn’t look like a theology of suffering. The Hallmark Channel show is a sweet and sentimental drama, telling the story of a cultured young woman who takes a job as school teacher on the Canadian frontier in 1910. She faces challenges. She learns lessons. She finds love, inner strength, and a supportive community. The show is finishing its fifth season this month. And it’s a big hit. More than 2.5 million viewers are expected to tune in for the finale on Sunday, April 22. The show has already been renewed for a sixth season, and the first four seasons are available on Netflix. Online, the show has an active fan community, including a “Hearties” Facebook group with more than 60,000 members. The story, though, with all its sweetness and light, is built on a real reckoning with tragedy. It comes out of an evangelical tradition that addressed itself to the burdened and brokenhearted. Read my latest piece at Evangelical History. 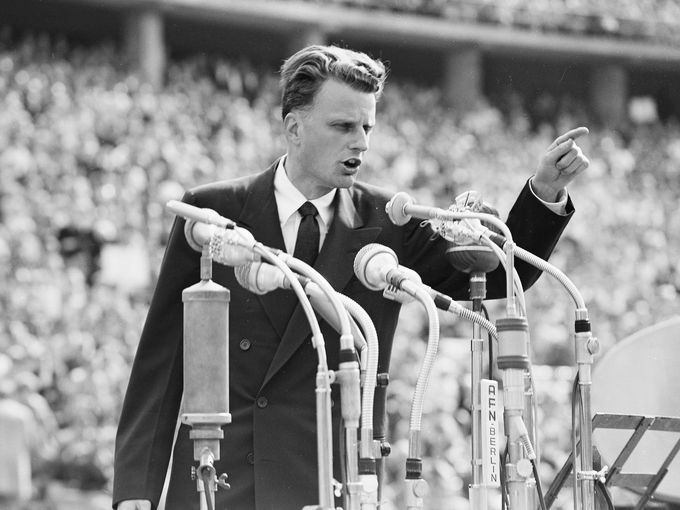 Billy Graham was the most famous Christian preacher in the world for more than half a century. He was so famous, people felt like they had to have an opinion about him. Graham died last week at 99. The evangelist lay in state at the U.S. Capitol Wednesday, and the country is debating his legacy. Was he “America’s pastor”? Should we think of him as the last bipartisan evangelical or a tool of partisan politics? Was he critical to the success of the civil rights movement or a white nationalist? Was he on the “wrong side of history”? Did he focus just on Jesus, or was Graham preaching a “hyper-nationalistic, militaristic and xenophobic” gospel? Graham is a cultural inkblot. Different people see different things. In death, as in life, he is the kind of famous figure who people define themselves by how they feel about him. Read my latest piece at the Washington Post. Ehud Sperling couldn’t find what he was looking for in physics classes. He had a half-articulated question about the ultimate nature of reality — the secret reality beneath or behind ordinary reality — but as he listened to lectures about atoms, energy, and the laws of motion, he felt the answer getting further and further away. He switched to psychology. Pysch classes didn’t help him with his question either. Then he went to Donald Weiser’s bookstore. Donald Weiser died on April 12 at the age of 89. His death was little noted, except for an item in Publishers Weekly and an intimate memorial with friends and family. The truth is, though, that Weiser and his book business changed the religious landscape in America. Read the full essay at Real Clear Religion.